Pictured above: To celebrate Mazda Canada’s 50th anniversary, a PATTISON Outdoor digital matrix displays a limited edition Guy Allen print, which fans can purchase using a tap-to-pay terminal shown on the right of the screen. TORONTO, ON, February 12, 2018 – PATTISON Outdoor, Canada’s leading Out-of-Home advertising company, along with its digital and interactive arm, Fourthwall partnered with agency, J. Walter Thompson and Mazda Canada to celebrate the automotive brand’s 50th anniversary with their followers. To commemorate the occasion, Mazda Canada is releasing a series of limited edition prints through a PATTISON Outdoor digital storefront designed exclusively for the event. This interactive digital campaign launched on Wednesday ahead of the Canadian International AutoShow, where the automotive brand is eligible to win two ‘Car of the Year’ awards from the Automobile Journalists Association of Canada (AJAC). 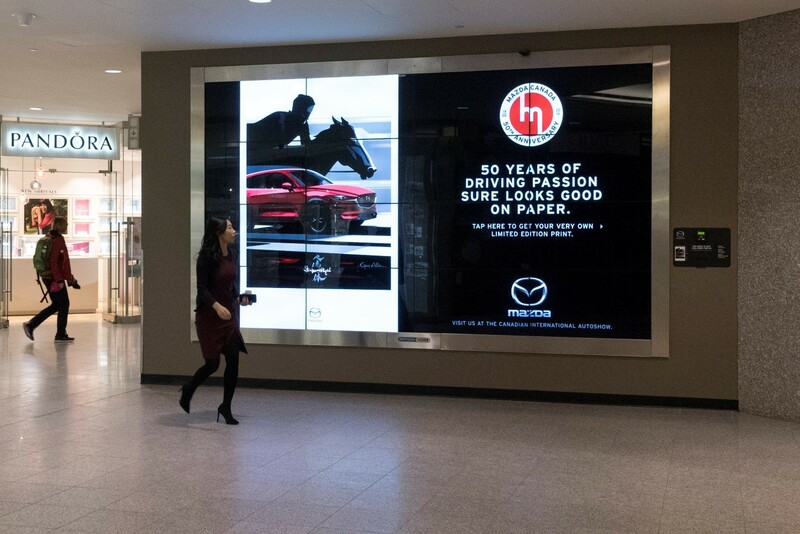 Located in the Royal Bank Plaza of Toronto’s PATH, this four-week interactive stunt is a first for PATTISON Outdoor, Fourthwall and Mazda. A 93” x 165” large format screen plays full-motion video, depicting the illustrations of British automotive artist, Guy Allen. Mazda’s brand messaging directs fans to a payment terminal where they can tap-to-purchase a limited edition 18” x 24” print. Buyers are then issued receipts with a unique code and dedicated website url where they can input their mailing address to redeem their posters. Each week of the four-week campaign offers passersby the opportunity to collect a new illustration in the Guy Allen series for Mazda. This ad appears in a busy retail concourse of the Royal Bank Plaza in Toronto and is a part of a larger four-week out-of-home campaign in-market during the same time period. PATTISON Outdoor Advertising, a division of The Jim Pattison Group, is Canada’s largest Out-of-Home advertising company. PATTISON provides innovative solutions for Out-of-Home advertising with products ranging from Classic billboards and posters to transit, digital, airports, residential, office, and street furniture. PATTISON offers Canada’s largest portfolio of Digital Out-of-Home (DOOH) advertising properties through PATTISON Onestop, a world-leader in the design, operation, and advancement of digital advertising networks for the office, transportation, sports retail, and residential environments, and with its experiential/interactive development arm at Fourth Wall. PATTISON is headquartered in Toronto Ontario and includes over 25 sales offices across the country providing advertisers unmatched reach and coverage with products available in nearly 200 markets coast to coast. PATTISON Outdoor Advertising is the exclusive supplier for advertising on the Toronto Transit Commission’s (TTC) transit system. Mazda Canada Inc. is responsible for the sales and marketing, customer service and parts support of Mazda vehicles in Canada. Headquartered in Richmond Hill, Ontario, Mazda Canada has a nationwide network of 165 dealerships. For additional information visit Mazda Canada’s media website at www.media.mazda.ca. Walter Thompson Worldwide has been making pioneering solutions that build enduring brands and business for more than 150 years. Headquartered in New York, J. Walter Thompson is a true global network with more than 200 offices in over 90 countries, employing nearly 10,000 marketing professionals. The agency consistently ranks among the top networks in the world and continues a dominant presence in the industry by staying on the leading edge—from hiring the industry’s first female copywriter to developing award-winning branded content today. For more information, please visit www.jwt.com and follow us @JWT_Worldwide.